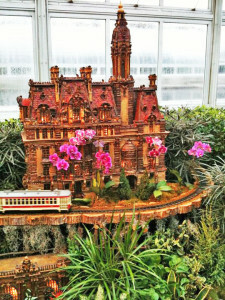 The New York Botanical Garden’s holiday train show is a well-loved NYC holiday tradition. This isn’t your average model train show. 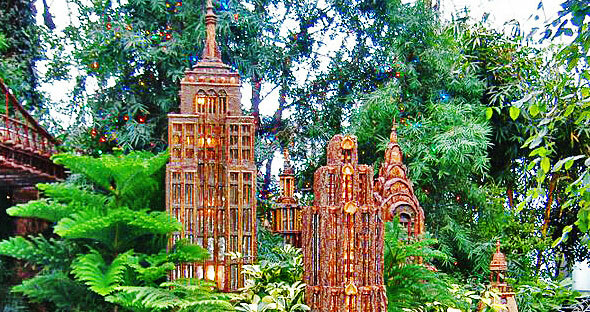 All the little buildings are replicas of NYC landmarks, and they’re all made out of plant materials. The level of detail they achieve is wonderful. The buildings are arranged in settings with real plants. Model trains make their way through the display. It’s all set up in the Conservatory building, where it’s nice and warm (tip: dress in layers – it may be cold outside, but the conservatory is always warm). Tickets are regularly $20 for adults, $18 for seniors, $18 for students with an ID, and $10 for children ages 2 – 12. New York Daily News article with photos and information about this year’s show. Goldstar also has discount weekday tickets to the holiday train show. Ticket prices vary buy date on this deal. Some dates have $6 kids and $12 adult tickets and some are $8.00 for kids and $14 for adults. You’ll need to search around on the different dates to find the best deals. Also, be aware that Goldstar adds at service fee of $2.50 to the kids tickets and $3.00 to the adult tickets. Update: $5 Cyber Monday sale tickets are now available for some dates. Mommy Poppins has a discount code good for 30% off on selected weekdays. This is a very popular event and it sells out. Tickets are timed and sold in 15 minute increments. Additional discount opportunities will be posted if they become available. Receive NYC budget travel info and deals delivered to your inbox – subscribe to our daily or weekly email updates.